The Muskrat is a highly-modified 22’ Marshall catboat. She daysails, races, and cruises on the Chesapeake Bay. Besides making the boat handier, safer, and faster, the yawl rig and bowsprit require additional sails, which of course is what the sailmaker wants! My wife’s sketch shows the original concept. 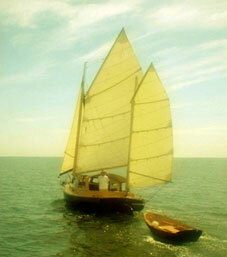 We sailed her with the Bermudan mizzen for a few years, then made the bigger high-peaked lugs’l shown in the photos. A half-wishbone sprit boom makes it self tending and self vanging. The sails are Bainbridge 5.5 oz Classic Cream. Full battens in the main and mizzen help flatten the low-aspect sails, facilitate reefing, and simplify furling in the lazy jacks. 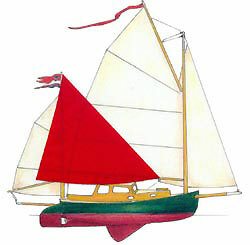 An earlier converted catboat, the 18' Dabbler, was also rigged as a gaff yawl. An article about her is on the Appendices page of this website. Between the two boats we have made a dozen sails, modifying and refining.